When choosing to use the bus, tourists will get from some terminals like Cho Ben Thanh Bus Terminal. It is located right in Ho Chi Minh City downtown, near Ben Thanh Market and Pham Ngu Lao. Dong Bus Terminal. If you will go to northern Vietnam. Usually the bus will depart from the terminal. From Cho Ben Thanh you have to take the bus No. 19 to arrive at the Mien Dong. Mien Tay Bus Station. To achieve this terminal you have to take the bus No. 139 from Tran Hung Dao. As well as Cholon Bus Station. The terminal rate of bus routes in the city by 3000 Dong per person. Many inter-city bus companies that drop off passengers around Pham Ngu Lao, De Tham west. It’s certainly easier for the tourists who are largely choosing accommodation in the backpacker area. When go outside from bus, it is likely you will be mobbed by taxi drivers. They will ask “Where you go?” most likely you already are close to the accommodation you ordered, or hotel that will be addressed. Which often occurs is, because tourists will look for a taxi confusion. Your taxi driver will rotate into several blocks until Hotel to be addressed, when in fact the hotel is only a few feet away. If you want to go to neighboring countries such as Cambodia. There are several bus companies that serve this route at the rate of USD12. The time it takes to arrive in Phnom Penh about 5 hours. Around the city by public bus is certainly very dance, although sometimes quite scary when you’re in a new place without knowing the local language. Public buses within the city of Ho Chi Minh City serving 150 routes. The bright green bus. You can find a map of the bus transport system in Ben Thanh Terminal. This book also attach a copy of the map of the bus. Around the city by bus is one of the most inexpensive ways, suitable for backpackers. Bus in Ho Chi Minh City is quite safe and not too full. Just like in many major cities in Southeast Asia, most of the locals choose to do their daily commute by motorcycle. Most buses are also quite comfortable with cooling, music, and some even provide television. One of the challenges of using the bus is looking for a suitable bus route. of course, you can always ask local people, but the language barrier makes it difficult sometimes. A good idea to write down goals on a piece of paper to facilitate communication. Map of Ho Chi Minh City Buses can be seen in vidiani.com. Sometimes the bus is considered more quickly and efficiently than taxis and other types of public transportation in Vietnam. The basis of this statement is because the traffic in Ho Chi Minh City is a mess, no one dared to block the bus. When there is a bus at the rear, all cars will get out. This of course does not happen if you took a taxi. Sai Gon Station or Cach Mang Thang is located at Tam, in the northwest of the city center. You can go to station use taxis or buses. From Sales Office official ticket located in the backpacker area of Pham Ngu Lao, precisely at 275C Pham Ngu Lao. There are five daily departures from Hanoi train passes through reunification. Of course, taxi and car rental is the most convenient way to get around. You may want to save money, but there are times when a taxi into the mode of transportation most efficient, especially if you have limited time. The cost of a taxi in Ho Chi Minh City including cheap. The rates change depending on the current fuel price. The normal rate ranges from 13,000 Dong per km. Not difficult to find a taxi in Ho Chi Minh City, especially if you are in the city center. You only need roadside waving to stop the cab. The difficult part is finding a reliable taxi. Taxi fares are not set by default so that each taxi company set rates according to their wishes, which sometimes change over time. However, due to the competitive market, 80% taxis operate with a relatively standard fare. 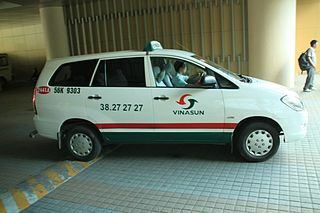 As already mentioned, two of the most vietnam recommended taxi is Mai Linh and Vinasun. Some taxis are quite reliable despite having a smaller fleet size as Petrolimex, Vinataxi, Petro Vietnam, Savico, Hoang Long, and Taxi Future. The driver usually can only speak very limited English. Therefore a piece papers reads the destination address would be helpful. You should also always carry a business card your hotel. Furthermore always take a small fraction of money. Most taxis in Vietnam are the Toyota Vios and Innova. Actually the first taxi only calculate the cost based on the distance. However, when the traffic jam, time is also taken into account. The more traffic, the passenger fee to be paid will be more greater. If you want to get out of town with a group, renting a car becomes an option. You can rent a car once the driver. Mai Linh and Vinasun provide this type of service. several taxi companies that should be avoided is Vinamet and Taxi-Meter. They are known to cheat the meter running. Passengers will be forced to pay three times more than it should. As already mentioned, avoid also taxi cabs with a similar name of Mai Linh and Vinasun, such as Mein Linh and Vinasum. They are notorious for deceiving passengers, even made off with your luggage. Saigon Tourist taxis with silver and pink flowers image cuup reliable if the driver agrees to use the meter. However, they are known to reject the use of the meter when the passengers are foreign tourists, especially when stopped at a touristy area. They usually ask for bargain prices which of course could be double the actual fare. Sometimes they are also asked to be paid in dollars. Tourist often gather Saigon taxi in the posh hotel. So when asked the hotel staff in a cab, you better mention specific taxi company. Saigon Air Taxi uses a white Isuzu car. With the most competitive rates, but they will charge more for the journey to the airport. Don’t get stuck.